For the first part of this novel all I could imagine was Titanic in space. I know you’re thinking “Whoa snap! That sounds awesome!” (or something equally cheesy) and it was. I really enjoyed the first part of the novel, but about a quarter of the way through the novel morphs in to a survival story with a lot of walking, which never interests me, and then with the introduction of the paranormal element I found myself slipping further and further away from the story. Lilac is the daughter of the richest man in the universe, her father built Icarus, the ship she is traveling on, and everyone keeps a safe distance from her for fear of reprisal by Lilac’s father. I liked that while Lilac is obscenely wealthy she never acts snobbish or like a poor little rich girl with too many problems. She was easy to relate to and I liked that during the survival situation she never complained and was really a strong heroine despite her upbringing. The chapters written from Tarver’s point of view were my favorite. I think that they were stronger, had more emotion, and I couldn’t get enough of Tarver’s back story. He is a military hero with extensive survival experience and is only aboard the Icarus for photo ops because that’s what high ranking officers are meant to do, schmooze. If the entire novel had been written from his point of view I would have enjoyed the story a bit more. Random rant: There are not enough YA/NA books with male perspective. The relationship between Lilac and Tarver is very love/hate. When they meet aboard the ship there is a mutual attraction but as soon as Tarver finds out whom Lilac is his feelings morph to disdain. And Lilac pushes Tarver away because of her father. When things do finally change between them (this isn’t a spoiler you knew it was coming) it happens very fast and it felt insta-everything. I liked Lilac and Tarver as separate characters but I didn’t care as much about them as a couple. 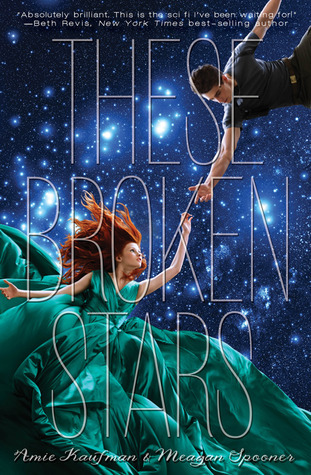 Overall, I liked These Broken Stars the first quarter of the novel was awesome and had me hooked but as the story morphed and changed I found myself feeling ever more distant and ultimately it ended up being a middle of the road read. 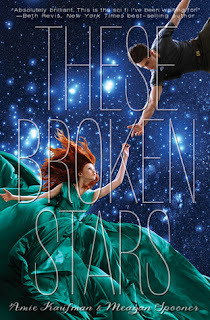 I’m unsure if I will be picking up the sequel but if the cover is as gorgeous as this one I might be conned in to it. The characters sound awesome, but what you said about the relationship element has me kind of cringing. I'm honestly not in any rush to pick this book up. Just doesn't sound like my thing. This book is so awesome. And that one huge twist in the middle? Gawd. I bawled my eyes out. It's unfortunate that it couldn't sustain your initial enjoyment though. What makes me want to read this book is the amount of things it has in it that i love. I love sci-fi, I love romance, I love rich girl poor boy stories, etc. Its like this book was meant for me haha.